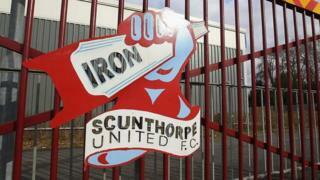 A £56,000 fee is to be returned to Scunthorpe United after a council failed to determine new stadium plans in time. The League One club said North Lincolnshire Council should have made a decision by November last year and has now agreed to refund the fee. The Glanford Park application is more than five months overdue, it said. North Lincolnshire Council has been approached for a comment but is yet to respond. Scunthorpe United chairman Peter Swann said: "The club is in no mood to celebrate the fee announcement, given the circumstances and exasperation which has caused the club to engage its solicitors to recover that fee. "The new stadium is vital to securing the long-term financial viability of Scunthorpe United and the council's ongoing delay to our application is jeopardising this." The club had originally wanted to relocate to a new stadium on land between Scunthorpe and the River Trent, the Local Democracy Reporting Service reported. But after various delays and complications regarding the move, which was part of a wider council project, the club chose to redevelop its current stadium. Scunthorpe lost 3-0 to Burton Albion on Saturday and are currently 19th in League One, just one point above the relegation zone.